The Eurofighter Typhoon is the one of the world's most advanced swing-role combat aircraft, with simultaneous air-to-air and air-to-surface capabilities. It is currently in service with seven air forces and on order with two more, and has already been combat proven during operations in Libya, Iraq and Syria. The Typhoon is built with advanced composite materials, to deliver a low radar profile and a strong airframe, and only a small percentage of the aircraft's surface is metal, delivering stealth operation and protection from radar-based systems. Pilots were included in the design from the earliest stages, to develop a deliberately unstable airframe that could still be flown effectively, and one that delivers both superior manoeuvrability at subsonic speeds and a supersonic capability to support the widest range of combat scenarios. Eurofighter Typhoon is also at the forefront of sensor technology, and the sensor suite continues to be upgraded to deliver enhanced detection and operational abilities. The PIRATE infra-red sensor provides passive air-to-air target detection and tracking performance in the IRST mode for covert tracking and air-to-surface operations in the Forward Looking Infrared (FLIR) mode. As well as Short Range Air-to-Air Missiles and the 27mm Mauser cannon, the Typhoon carries the latest beyond-visual-range air-to-air missile technology. Soon the Meteor advanced long-range missile will provide a long stand-off range as well. Its Laser Designator Pod (LDP) also enables precise location of targets and guidance of air-to-surface weapons, and the Typhoon has also been upgraded with the Paveway IV, with its combat proven dual-mode guidance system, coupled with height of burst and penetrating capability. The Defensive Aids Sub-System (DASS) comprises of wingtip Electronic Support Measures and Electronic Counter Measures pods (ESM/ECM), missile detectors and chaff and flare dispensers. The aircraft has the Captor-M mechanically scanned radar, and the Captor-E electronically scanned radar is the future primary sensor. The pilot is fitted with a unique Helmet Mounted Symbology System (HMSS), which provides flight reference and weapon data aiming through his visor, and is fully compatible with night vision aids and Forward Looking Infrared (FLIR) imagery. The Eurofighter Typhoon is a highly agile aircraft, designed to be a supremely effective dogfighter and ground attack platform, and one that will be in service for many years to come. 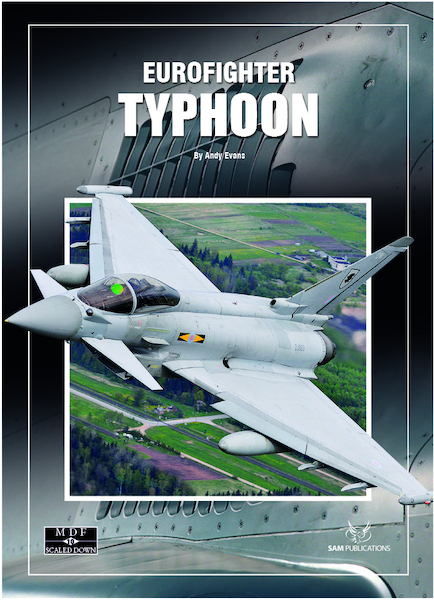 This new MDF Scaled Down from SAM Publications bring the Eurofighter story to life, and is packed with information, and in full colour throughout and will be an ideal reference for both the modeller and enthusiast alike.